Resolution for movies and television is constantly expanding and the UHD 4K (which is 4 times higher resolution than our current hi-def standard of 1080), requires a lot more capacity than a 25GB Blu-ray can provide. That is why recordable media manufacturers of all kinds, including optical discs, hard drives, and flash media are increasing the size and speed at which the media can record at. Of course, these large capacity CF cards come at a steep price (upwards of nearly $500 to $1,000 each) and could be price prohibitive to buy more than one or a couple to capture the original content. Thatâ€™s why optical discs are still the most practical solution for distributing UHD content. For just a few dollars or less than 1% of the cost of the CF cards, one could purchase a recordable Blu-ray 25GB, 50GB, 100GB, or higher capacity for mass production to the consumer market. Even as the content gets bigger and more complex, itâ€™s nice to know that Optical discs make that content more affordable for the masses. Whether you are looking for blank media, including the high capacity BD-R, or for steps on how to back up or create your content, Vinpower has a solution for you. Vinpower carries a number of all types of recordable media, especially optical discs, and duplication hardware, including CF to USB adaptors so that it can be reproduced through our USB duplicators. Whatever you need in the duplication field, Vinpower can provide. 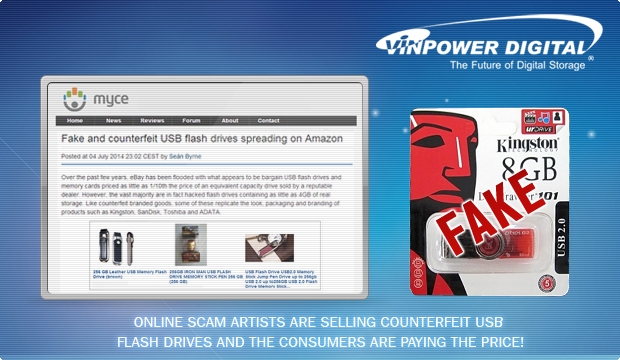 Online scam artists are selling counterfeit USB Flash Drives and the consumers are paying the price! You know the saying itâ€™s too good to be true, well everyday unscrupulous individuals try to sell counterfeit items for what seems like a great deal, only to find out they are not what they appear. A recent article, http://www.myce.com/news/fake-and-counterfeit-usb-flash-drives-spreading-on-amazon-72165/, examined the rash of large capacity USB flash drives that turn out to be nothing more than much smaller capacity with a hacked firmware that makes it look like an authentic drive. Itâ€™s not until you actually use the flash drive and discover that your content was overwritten or never copied accurately to begin with, that you discover the true capacity. Since Vinpower sells a large number of USB duplicators, we see all kinds of low quality and fake USB Flash Drives. Often they look like a more reputable brand or in fact pretend to be that brand, so the customers often blame the hardware. After we reveal the true nature of their flash drive, then they realize that they purchased a fraudulent product. So when you are looking for the right USB Duplicator or flash drive to copy, donâ€™t get caught up in price alone, check to make sure you are getting an authentic reputable product that will meet your storage and duplication needs. Vinpower ensures all of our products are up to the highest standards, including hardware, media, and components, so that the recipient gets their moneyâ€™s worth instead of wasting time and money wondering whether the product they purchased was a good deal or they were taken advantage of with fake merchandise. Donâ€™t leave it to chance, Vinpower stands by the products they offer. Pioneer and Memory-Tech are co-working to create a new high capacity 512GB optical disc specifically designed for data archiving. As companies like Facebook have recently publicized, keeping critical data archived on a physical media is crucial for long term storage and data recovery. There are plenty of companies working on larger capacity optical media, even as large as 1TB, but this is the first publicized report of an extremely high capacity optical disc developed specifically with long term archival as the focus. Whether itâ€™s for highly sensitive government or corporate material or your childâ€™s 1st birthday photos, proper archival optical discs are still the safest and most reliable method for archiving. 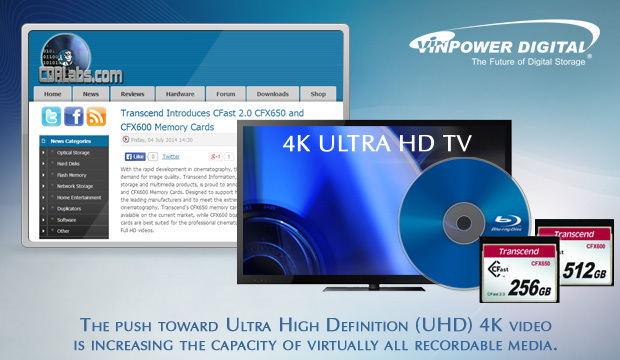 Even though the 512GB archival discs are not yet available, Vinpower does offer a 25GB archival optical disc solution. Contact Vinpower Digital today for all of your digital media and duplication needs.